Charles Richard Troughton, bank cashier, 40, Henry Richard Brockman, 50, John Benjamin Dike, 41, George William Ladd, 38, Edward Robert Crunden, 31, Robert Ernest Cook, 26, William Philpott Cook, 54, William Richard Gill, 35, and William Philpott Cook, Jun., 28. Evidence of identification having been given. Robert Ladd, one of the survivors, deposed that about 5.30 on Thursday morning he was called up. He went to the harbour, and found the surf boat Friend To All Nations about to leave. He got on board, as more assistance was wanted, and believed that all the deceased men were in the boat, as well as Henry Brockhurst, Jun., Gilbert, and J. Epps, making 13 in all. They crossed the bat with a north wind. On getting to the spit of the Nayland Rock, a large sea struck the boar, and turned her on her beam ends. She gradually heeled further over, and all in her were thrown into the water. He felt himself in the sails, and heard the mast break. He got clear and seized the boar, seeing henry Brockhurst on the other side. The boat drifted into the bay near the Royal Crescent. Witness had been in the habit of going in the boat for the past ten years, and it had never been turned over before. He did not know if the boat was self-righting. The crew wore no lifebelts. They had them in the boat-house, but had never been in the habit of using them, because they were an encumbrance. All the crew wore heavy clothing. The boat capsized in about 12ft. of water, about a quarter of a mile from the shore. Witness thought he was clinging to the vessel about 15 minutes before it was washed against the sea-wall. When the boat capsized they were sailing close to the wind, so as to reach their object on the second tack. The sheet was not fastened, but was held by a half turn round the pump, so that it could easily be let go. Witness was so weak that he could not get up the steps, and was assisted by a lamp-lighter. The boat, which had a draught of only 2 ft., did not ship much water. When the vessel capsized, someone called out “help.” While on the boat, he saw a man whom he believed to be Mr. Troughton, trying to get through the surf on the rocks. The vessel was clear of the spit of the Nayland when she capsized. He did not know whether any one was in charge of the halyards, but someone was as a rule, and he was sure that they would run. There was not sufficient wind to have capsized the boat if the sheet had been fastened. Henry Brockman, 26, another of the survivors, said that on Thursday morning he was one of the crew of the surf boat. They left the harbour about half-past 5. Ten minutes later when they got towards the spit of the Nayland, the sea ran up to them, and, thinking it was about to swamp them, he seized hold of the side. The boat turned over, and he felt that he was underneath. He managed to get clear, and hung on to the capsized craft. It was a good boat, but, personally, he preferred the National Lifeboat Institution’s Lifeboat Quiver, as it was better adapted for bad weather. The witness said he was exhausted by the time he was washed against the sea-wall, and a lamplighter, noticing his condition, came to his assistance, and pulled him up. When it broke over the boat, the sea must have struck the sail. He did not know who held the sheet. The storm-sail was up at the time, but, in his opinion, the water was not much for the boar. In reply to the jury, he was unable to say that any one was standing by the halyards at the moment of the disaster. The life-belts were more cumbersome in the surf boat than in the Quiver, and the crew could not row in them. A regulation of the National Lifeboat Institution was that all men proceeding to sea in their boats must wear life-belts. In the present case, belts would have been useful, and would in all probability have prevented so great a loss of life. Had he, however, worn a belt himself, he would probably have lost his life when the boat turned over on him. But the wearing of life-belts was entirely optional. The sea was sufficient to capsize the boat even had she had no sail up. It was not an ordinary sea, but a long curling sea that struck the boat. John James Gilbert, another of the survivors, 20, stated that he had been out in the Friend To All Nations in worse weather that what experienced on Thursday. He was on the port bow, and when they were off the Nayland, he suddenly found himself in the water. He was under the boat, but diving down, got clear, and then, seizing the overturned boat, clung to it for 20 minutes, when he found himself near to the Royal Crescent seawall. He was then very much exhausted. Epps, another of the survivors, was underneath the boat the whole time. Witness added that he never wore a life-belt, not caring for them, and had he been wearing one on Thursday, he must have been drowned. He did not know if any one was at the halyards. There was always someone there, but he did not know if the sail was slipped. He did not see the big sea that overwhelmed them. The sheet was never fastened, but was always held by half a turn round the pump. If it were struck by a sea, it would be forced out of the man’s hand. W. Cook, senior, was the coxswain, and Mr. Troughton generally sat by him. Evidence of the finding of the bodies was then given, and the Coroner pointed out that the sad event was a pure accident. One of the jurymen observed that the sea was rough enough to capsize the boat even had she had no sail up. The jury returned a verdict of “Accidental death,” and asked the Coroner to convey their sympathy to the relatives and friends of the deceased men. 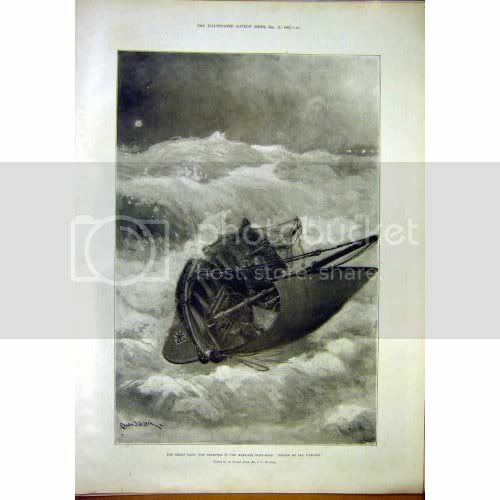 By the 2nd December 1897 a terrifying gale had been raging for four days sometimes reaching hurricane force, many boats out in the English Channel were stuck in the storm and many must have feared for their lives and called for help, one of these boats was the Persian Empire who was off the Nayland Rock near Margate. The ship had been in a collision with the Steamship Carlisle City the previous evening. It was common at the time for Margate Surf Boat to attend these calls before the RNLI got involved and this was what happened on this particular morning. The Surf Boat, Friend To All Nations was launched from the harbour slipway in Margate at around 05.15 carrying 13 men, she headed into the rough seas but when they reached the Nayland Rock two massive waves hit in succession and capsized the Surf Boat. One of the survivors described one of the waves as ?a monster, a long, curling roller?. The crew of the Persian Empire were saved by the lifeboat Quiver who had been launched 15 minutes later than the Surf Boat and had no knowledge of the fate of her rescue attempt. At daybreak the full horror of what had happened became obvious as the bodies of the Surf Boat crew started being washed ashore, out of the 13 crew members only 4 survived. The four survivors were Robert Ladd, Henry John Brockman, John James Gilbert and Joseph W. Epps who had been saved by being trapped in a small pocket of air beneath the capsized boat. The tragic loss was felt across Margate and during the funeral procession from the Parade the locals lined the streets all dressed in black. The shops were closed with blinds drawn in houses and church bells tolled filled the town with their mournful sound. The procession headed to St John's Church where a service was read over the coffins before they made their way to their resting place at St John's Cemetery, Margate. It was estimated that around 3000 people had lined the streets to give their support. After the disaster a fund was raised by local dignitaries and councilors to give support to the 5 widows and the 17 children left destitute. The fund grew so bit that two memorials were also funded, although the original plan had been to build almshouses for the families. People from all over the world gave money with the Daily Telegraph raising over £1,000 and Queen Victoria donating £35. The total eventually reached just over £10,000. The widows were given 15 shillings per week. 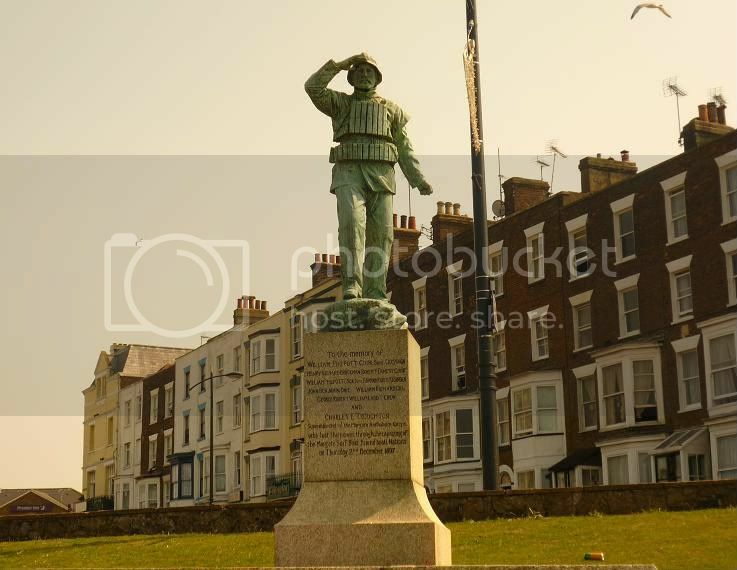 A bronze figure of a Lifeboatman was erected looking over the Nayland Rock opposite to where the survivors were washed ashore, the second memorial was placed in the Cemetery and was so large the road to the cemetery had to be strengthened to support the weight. The Friend To All Nations suffered only damage to her mast and rigging and was returned to Margate. She was soon back out saving people however she was lost on the 30 November 1898 while under tow in the Kentish Knock, she was finally recovered near Great Yarmouth and although she was repaired she was not used again. 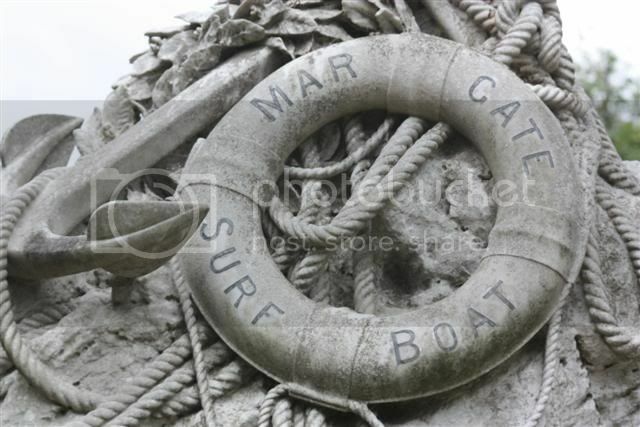 "IN MEMORY OF NINE HEROIC MEN WHO LOST THEIR LIVES BY THE CAPSIZING OF THE MARGATE SURF BOAT "FRIEND TO ALL NATIONS" IN ATTEMPTING TO ASSIST A VESSEL IN DISTRESS AT SEA 2ND DECEMBER 1897." The memorial is surrounded by a square white marble kerb with 8 tablets bearing the names of the crew members who perished and a quotation. 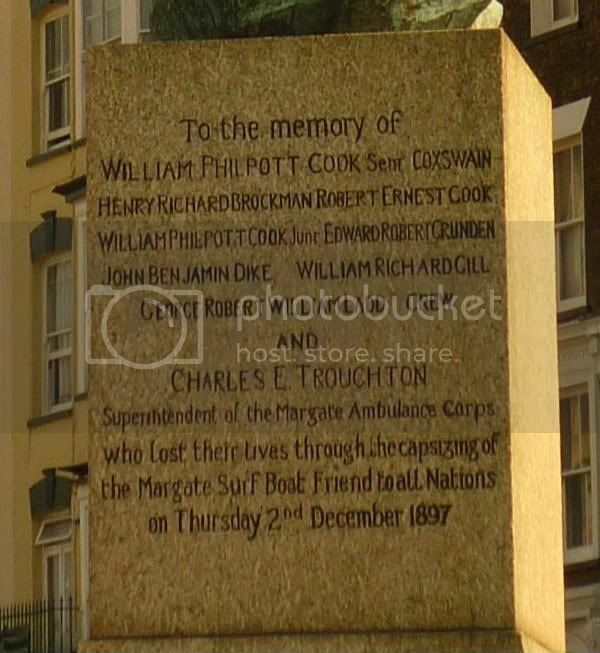 Charles Troughton, the Superintendent to the Margate Ambulance Corps has his names inscribed on the front kerb. This from the website www.kentresources.co.uk I've copied the text rather than give the link as no pictures appear to be hosted on the site any more. When entering Margate seafront from Westbrook, it is impossible not to notice the statue of a figure permanently looking out to sea over the infamous Nayland Rocks. The figure is shading his eyes and clad in oilskins and an old cork life jacket. 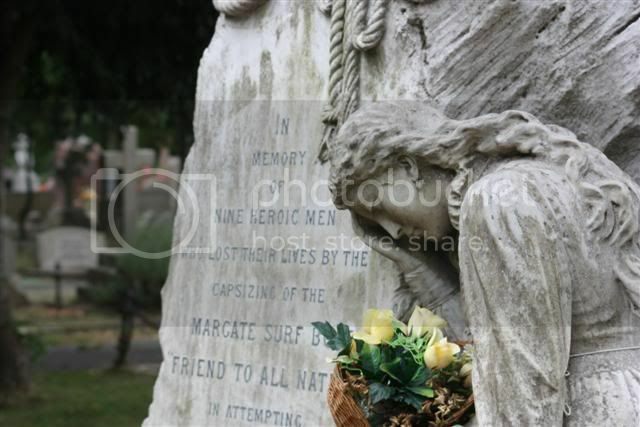 The monument was erected to nine men of Margate that lost their lives in the Friend to all Nations surf-boat tragedy on the night of Thursday, December 2nd, 1897. In the last century, it was common for many towns and/or ports on the coast to provide a surf-boat crewed by local men although at the time there were also R.N.L.I. Lifeboats being strategically placed around the coast as well. So it was in Margate which had a R.N.L.I. boat named the Quiver but also still used its surf-boat. The surf-boat at Margate had no motor but was powered by sails and was not self-righting. In this particular year, the Kent Coast had been lashed by hurricane force winds from November 28th and the damage was worse than caused by later storms in 1953 and 1978. Granite blocks were actually torn out of place on the seawall and promenade. It was on the last night of this storm that a ship by the name of Persian Empire had gone aground on the Margate Sands following a collision. Both the Quiver and the Friend to all Nations put out from the Harbour but as the surf-boat reached the open sea away from the relative shelter of the Harbour wall, she was hit by two huge rollers, one after the other which caused her to capsize. The surf-boat was washed ashore near the Nayland Rocks with only four surviving crew members clinging to her. Surprisingly, it was determined at the inquest that followed, that none of the crew members had been wearing their lifejackets which were available to them. 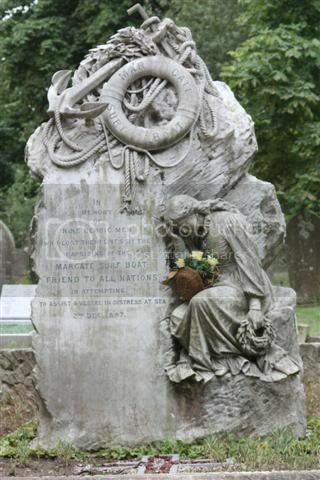 Nine men were lost that night and it was a terrible disaster for the Town and contributions poured in from all over the Country for the Widows and Orphans of the dead crewmen.